The sun hung over the cow pasture and its rays flowed silently through the windows into the big front room of the Back to Godhead magazine building. The space was mostly empty, except for two huge desks facing each other in the middle of the room, each topped with a new computer. One wall was hung with dozens of framed magazine covers. The plush blue carpet looked barely walked on. Somewhere in a back room came the tapping of a keyboard and the occasional creak of someone shifting in his chair. Otherwise it was quiet - that loud, echoing quiet of a late summer morning in the country when there's absolutely nothing going on. Yet. I started up my computer, and while it did its thing, I opened up my notebook and flipped through a few pages. I got a pen out of my bag and set it next to my notebook as my monitor jumped to life with a static crackle. I could hear Manu’s computer whirring to life while he opened and closed the empty drawers in his desk. The computer monitors were between us, so I leaned to the right and cleared my throat. The sound exploded in the quiet building. Manu leaned sideways and looked at me. It’s been one long blur of activity since that first quiet morning. I barely remember specific events in the ten years since we first started Krishna.com. We quickly gathered steam and rocketed forward without one backwards glance. And suddenly I look around and it’s been ten years. In 2001, if you had typed www.krishna.com into your web browser, you would have been taken to the website for Back to Godhead magazine. That’s because, back in the stone age of the Internet, one of the directors of the magazine had looked ahead and seen how important the web would be for offering Krishna consciousness to the world, and he purchased the domain name. While he waited for inspiration to strike in developing a website there, he used it to promote the magazine. 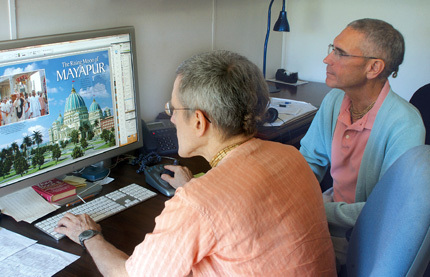 A happy coincidence brought together the directors of Back to Godhead magazine and the Bhaktivedanta Book Trust. The BTG team wanted to make a website that served the magazine’s audience of people practicing Krishna consciousness and people just beginning to learn about bhakti yoga. At the same time, the BBT wanted a website that offered the books and teachings of Srila Prabhupada to anyone who was interested and searching the web. The BBT committed funding, and the BTG team took responsibility for developing the website - whatever it would be. How do you start up a website all about Krishna? He is infinite, after all. He is everywhere and in everything. He is the first, the last, and everything in between. So where do you start? It was any other morning for me. I was freelance web developing from home for a while after leaving the newspaper Hare Krishna World (ISKCON World Review). The phone call came from a friend’s mother, offering me an interesting job: a new devotee website. She couldn’t tell me much about it. But she did say Manu Dasa was also on the project. Because of my curiosity for the challenge she was offering, and because I had a deep respect for Manu’s reputation, I agreed to come for a meeting to talk about it. We met in a small back room, so cramped that our notepads and elbows constantly banged into each other while we talked about this new site. Pranada Dasi and Tamraparni Dasa, both from BTG, and Manu and me - both ISKCON second generation. We talked about technology and websites, visitors, readers, books, pictures and software. We got excited about what we could do with the project. 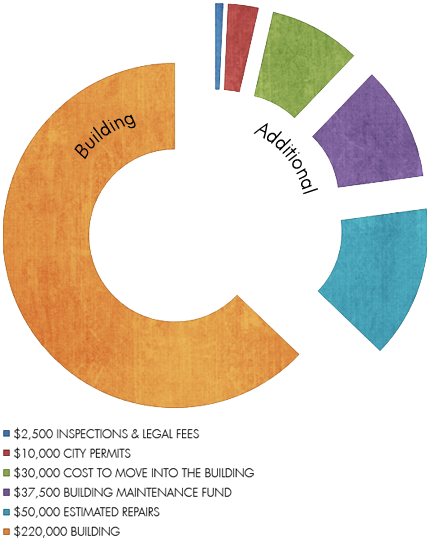 We made notes about what we envisioned building. There was a fantastic shared sense of the site's potential, as if Krishna Himself was watching over us, waiting to see what we would make of the opportunity He was giving us. Manu and I showed up for our first day of the new job. We were taking over the large front room of the offices of Back to Godhead. Part of the building was for the magazine, and part was living space for the BTG staff, as well as a room saved for Jayadvaita Swami when he visited. No one was quite sure what this new project would turn into, so we were given "‘new"’ desks scavenged from the local school system and new computers. That was about all we were on day one. Manu and I were to be the daily workers. Pranada and Tamraparni came in for vision and planning meetings, to look at what we were building, as their schedules allowed. We had to invent this website from the ground up, from the darkness of the vacuum of the Internet. Everything happened so quickly after that first day. We were excited by what we were doing. We worked as quickly as possible because there was so much to do. And we kept pace with the Internet, a constantly changing, expanding force in itself. We had to make big statements instead of small goals, because of the ever-changing nature of the Web. Our plans were big instead of specific. Our goals were huge. Almost overwhelming. We decided we would make Krishna.com inclusive instead of exclusive. As inviting as possible, so that anyone with a hint of interest in Krishna consciousness would feel welcome. We had to look at everything we did with a careful eye to make sure we were talking openly to people who had never heard of Sanskrit. We had to explain the art we used with the "‘blue boy"’ in it. We had to give the site a clean, open and neutral design so spiritual seekers would feel like they were welcome to look around and ask questions. The entire site has changed over a dozen times over the years, at least to look at it - the navigation buttons on the top, the menu options, the features and services, the logo, the home page - even the people working and volunteering for Krishna.com have changed over. But the message has stayed the same. We stand by Srila Prabhupada’s teachings about Krishna consciousness as the core of what Krishna.com is. After six months of agonizing over colors, fonts, logos, tag lines, software, articles, pictures, features, and a thousand other things, we were finally able to turn off the site that featured Back to Godhead magazine, and turn on the site all about Krishna. It wasn’t ALL about Krishna yet, but we had started the gargantuan project with our first few steps here. We had all gathered in the office that day when we officially opened up Krishna.com. We didn’t want to make a big deal out of it for a few weeks until we had worked out all of the bugs. But we were there, working together, pretending not to wonder if anyone had been to the new site yet. Manu finally said it had been over an hour and he wanted to know. So he logged into the site’s traffic- counting program and saw that six people had been to the site since we switched over. This was amazing to us. Six whole people! At this rate we might get a few thousand people a month visiting the site! Oh, gosh. After that first excitement, we got quiet again and looked at each other. We had so much to do now. With people visiting the site, we had to work twice as fast to put up more content, more articles, more pictures, more books, more ways for visitors to learn about Krishna. And now that were had a live website, we had to do it right away! Some things haven’t changed on Krishna.com all that much. The gallery of Krishna conscious paintings is still one of the most popular parts of the site. People still download and read PDFs of Srila Prabhupada’s books for free. Visitors still email us from around the world asking about Krishna, Krishna consciousness, how to find their local temple, when the next Ekadasi is, where to get a copy of "that book by that swami that my friend in college had given me but I lost because I didn’t know what it was about." With the rise of the Internet as the new social forum, Krishna.com has become a public reading room for Srila Prabhupada’s books. It is an art gallery of paintings of Krishna and His avatars and pastimes. It is a virtual temple for worship for those who live far from temples (or who are physically unable to travel to see deities). It is a courtyard for people who have been practicing bhakti yoga for decades to discuss philosophy and spiritual life with new visitors interested in Krishna. It is a place to leave offer homage to, and read about, Srila Prabhupada, the teacher and activist who brought Krishna consciousness to the Western world. 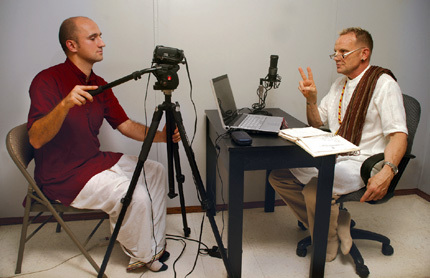 It is a media complex for vintage, classic, and new video and audio of lectures, kirtan, documentaries, books, and more. Krishna.com has become so vast, it’s sometimes hard to find one's way around. So we’ve started making little planets within the universe. One of our newest planets is kirtan.krishna.com, a community for sharing bhajans and kirtans recorded live at events around the world. There’s food.krishna.com, our cooking community. 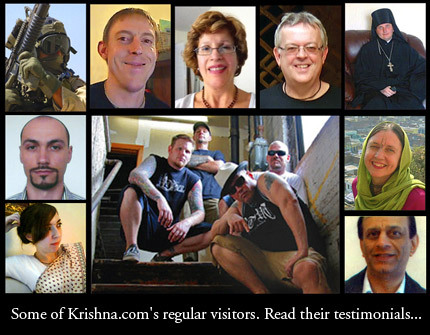 And of course btg.krishna.com, home of the Back to Godhead magazine, including bonus online-only features. We have Prabhupada.krishna.com, a home for everything about Srila Prabhupada’s life and teachings. And directory.krishna.com (ISKCON Temple Directory) and links.krishna.com (Links Community), help visitors find their way off the Krisha.com website. It doesn’t end there, because we’re bringing Krishna.com directly to the Internet streets wherever we can. We’re on Facebook, MySpace, Twitter, and Tumblr. We have a huge mailing list with thousands of people asking to receive newsletters and e-mailings on Krishna Meditations, daily ebook readings, updates on the site and store, information on BTG magazine, alerts to live shows or temple webcams, and more. For those who don’t like the commercialism of other social networks, we have our Connect community for people to create profiles and share with other Krishna conscious people. And for visitors who have specific questions, we have volunteers manning our Live Help system for live chat or in-depth email response. We’re starting to add interactive features throughout the site, inviting our readers and visitors to rate and comment on just about everything. Recipes in the Food Channel, articles in BTG’s online magazine, links to other sites in our links community, and more. Because Krisha.com isn’t just what we publish to the site. It’s also about the people who visit and use the site. At the beginning of 2009, both of our senior managers, Tamraparni and Pranada, had to step away from managing Krishna.com. Manu and I, along with the head of our web department, stepped up and took over running the whole project. This seemed like a natural development for us, but we realized we were setting precedence. This was the first established ISKCON project managed entirely by ISKCON’s second generation. We now were under pressure to prove this could be done. The first generation is looking at retiring over the next decade, and this was an opportunity for the second generation to step up and carry on the work of their parents. It can be done. The question on everyone’s minds though, was whether Krishna.com could maintain the integrity of spiritual wisdom that Srila Prabhupada had taught and his disciples had sincerely continued. Whenever this comes up, I have to elaborate on the wide network of advisors, teachers, preachers, writers, scholars, and specialists that we have always consulted with on Krishna.com’s material. Our core goal has always been to offer Krishna consciousness as Srila Prabhupada had taught it. Simple. Well, not so simple. Oh, the goal is simple, don’t get me wrong. And we have such a rich pool of advisors to guide us, as well as a broad archive of lectures, letters, books, and video of Srila Prabhupada discussing all manner of issues. The not-so-simple part is what keeps me awake some nights. A lot of people visit Krishna.com. No, I mean a LOT of people visit Krishna.com. We were so busy working these last ten years that we hardly had a chance to look up and see the results of our labor. She was so cheery and animated. She wanted to buy a new bead bag and possibly some neck beads. But mostly she wanted to see where Krishna.com was from. She was newly initiated and very excited about her spiritual journey. It turned out that her very first experience with Krishna consciousness had been through Krishna.com. She had stumbled across the site in her search for meaning in life, and something struck a chord. I admit that after she left, I went back to my shared office, closed the door, and sat there quiet for a few minutes. At some level I always knew that Krishna.com was important, but it never occurred to me just how important. I see the numbers and the locations of our visitors. I read the emails. I look at the lists of people in our mailing software. But it becomes so much more real when someone visits you in person and tells you how her life was immeasurably altered because of your actions. It’s a sobering thought that has only added to our urgency to expand and strengthen Krishna.com as quickly as possible. We hadn’t realized until recently that while we were busy working, people had started relying on Krishna.com for their spiritual lives. 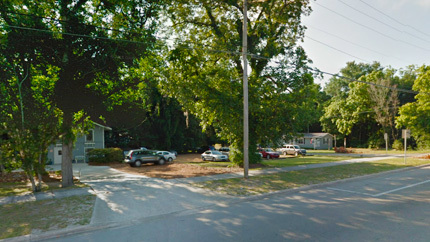 I’m sitting at home now, thinking of that first quiet day at work at Krishna.com’s office. I have to work at home when I need quiet because the BTG/Krishna.com building is always a hive of activity, and the 10’ x 12’ office I share with Uddhava and Manu is one of the busiest little spaces in possibly a five-mile radius. People are always popping in to ask questions, pass along messages, remind us to do something, show in visitors, or ask what to do next. There’s music, people on phones, the constant clicking of fingers on keyboards, co-workers chatting as they pass each other in the tiny hallway. Our little mobile home is so packed with people and activity, I sometimes fear the whole thing is going to start shaking one day and the walls will just burst outward. I don’t know that anyone will notice much because we are all so focused on our projects. Even though our little family here at Krishna.com is packed into the building three or four to an office, bumping elbows and vying for electrical outlets for their computers, it’s a very cheerful group. Even though our horrible rural Internet connection flickers on and off all day, making our tasks nearly impossible, our team rolls with the punches and fails to get grouchy at each other. And for that I am grateful. The forethought in my mind these days is that it’s time to move into the town itself and find a building we can fit into reasonably. I feel that Krishna’s hands have continuously been steering this project since day one, and I have complete faith that He will continue to do so. But I also know that "the helping hand you need is the one at the end of your own arm." It’s time to really push the limits of our energy to make this a reality. We have to balance this very real task with the ongoing work to rewrite the site's entire "About Krishna" section, create a version of the entire site that is suited to smart phones and other mobile devices, and keep up with the next round of Internet and software upgrades just around the corner. Ten years ago it was fun because we were new at this and every challenge was exciting. But now. . ? Now . . . okay, I admit it’s still fun. I love these challenges. There’s just more pressure now because many more people rely on Krishna.com’s existence. And of course now instead of four people, there are easily forty people that who contribute daily to the site. 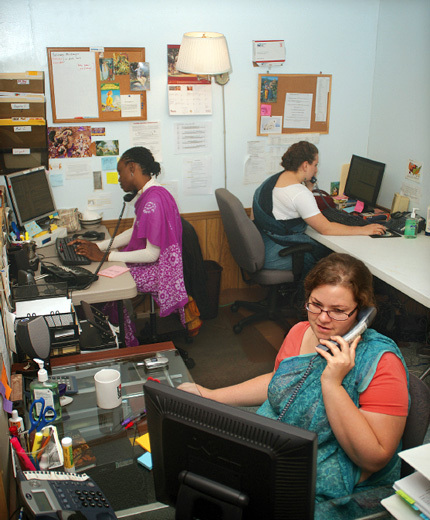 More than half are unpaid volunteers that who donate their time because they also see the value of Krishna.com’s existence. Fortunately, they also live around the world and don’t need office space, too. 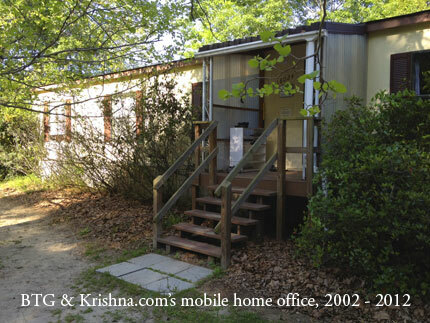 As I write this, I’m about to leave my peaceful home office and head into the BTG/Krishna.com offices. It’s Monday, which means it’ll be more busy than average. I’m sure only a small amount of my to-do list will be seen to. It’s easy to feel overwhelmed by the sheer volume of tasks that still need to be done. But I take on one project, then another, and another, and suddenly four months have zoomed by and we’re launching another section of Krishna.com. It is never-ending after all. A website all about Krishna? That could take 300 years and a staff of thousands. Where do we start? At the very beginning. That quiet moment in the beginning when we knew it was possible. Although the saying is that a rose by any other name would smell as sweet, you might not want to sniff something if you didn’t know what it was. This was one of the major considerations we had to make from the very first day when choosing what words to use, and of course how to spell them. We use a lot of Sanskrit, Bengali, or Hindi words in our every-day dialogues with other devotees. But people new to Krishna consciousness are unfamiliar with some of the words we think of as common. Words like yoga, mantra, or guru are becoming somewhat mainstream in the Western world, but Siksastaka or varnashram might leave some readers feeling lost. At the very start, we had to choose between "Krsna.com" or "Krishna.com." We have both URLs, and in fact you can still type either one into your address bar and arrive at the site. But we had two limitations. "Krsna" is the more traditional spelling, with diacritics/accents. But diacritics were not computer-friendly back then, and still give a lot of trouble. And we also had to respect the large number of visitors who would see "Krsna" and not know how to pronounce it. We decided we had to use "Krishna," spelled out phonetically. We decided that we wanted to be inclusive and inviting rather than require our new visitors to learn a whole new language right away. So we spell out many Sanskrit words rather than use diacritics like we do in BTG. And if we can use a more Western term or word in place of a Sanskrit one, we often choose to do this, such as bhakti yoga and Krishna consciousness. At least for the introductory articles and general information areas new visitors might find themselves. Ten years ago the Store at Krishna.com was a few pages in the printed BTG magazine and BTG online. There wasn’t a whole lot to it. You had to mail, email, or call in your order and payment information. Sometimes we had what people wanted and sometimes not. In the fall of 2002 we chose ecommerce software from a small start-up company and opened our first interactive online shop with 400 items. Since then, that small software company has been bought by eBay and the software is being further developed to power eBay’s small- business-keepers markets. So we have the benefits of a larger company developing the software we use. And our original product line of 400 items has grown significantly to about 8,000. What was once a list of books, cassettes, videos, and a miscellaneous assortment of japa beads, Tulasi neck beads, and children’s toys has grown to include devotional clothing of all kinds, Deities and accessories for your home altar, a large selection of incense, and much more. We saw the switch from cassettes to CDs, and now we’re watching CD sales drop in favor of downloading MP3s. The whole goal of the store from the very beginning was to create income for BTG and Krishna.com. This is still the case, and many of our long-time customers are pleasantly surprised when they find out that by shopping at the store, they are essentially making a donation. In 2009, our original core of four was shaken up by the inevitable passage of time. Pranada and Tamraparni both had to step back from directly managing Krishna.com, leaving Manu and I in charge of this amazing, intimidating, humongous project. We both had so much going on in our lives already, we weren’t sure we could keep the whole project going with half of our team gone suddenly. But letting Krishna.com slowly roll to a stop and fall apart wasn’t an option. We had over twenty employees, dozens of volunteers, and hundreds of thousands of visitors to consider. We drew in the head of our web tech department, Uddhava Dasa, and decided the three of us would become co-managers of Krishna.com/BTG. 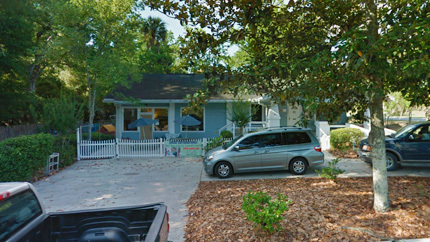 The Back to Godhead board and the BBT trustees, the parents of Krishna.com, accepted our proposal. And Krishna.com quietly became the first established ISKCON core organization run entirely by ISKCON’s second generation. That’s not to say, "we’re young and we know better than anyone else." We have a great mix of older and younger devotees on our team, giving this project a wonderful balance of wisdom and energy. The disciples of Srila Prabhupada who contribute to Krishna.com offer a steady hand and realistic advice on remaining true to Prabhupada’s original intentions and directives for preaching Krishna consciousness. And our second generation (and even third now) provides the enthusiasm and technical fearlessness to ride the trends of the ever-changing Internet. 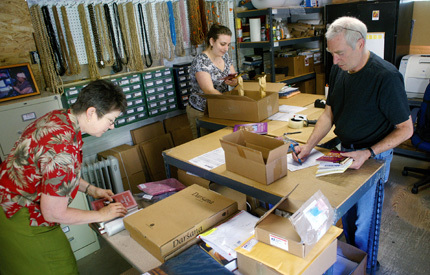 Balance, awareness, dedication, respect, and a shared goal keep Krishna.com’s team of hard working staff and volunteers moving forward. It’s so easy to let the weight of Krishna.com rest heavily on my shoulders. I’ve been here since the beginning. All of the people involved are dear friends of mine. Every day I have to somehow make ends meet so that bills get paid, problems get solved, potential hazards get avoided, emails get answered, and on and on. Every once in a while I get to lift my head out of the daily grind and am rewarded with a reminder about why we’re all doing this. A man from Texas called, asking if we ever heard of this book with a blue guy on the cover, and possibly horses, by an old swami from India. Apparently his brother had been given a copy of the Bhagavad-gita in the '70s after returning from Vietnam. And instead of committing suicide, the brother had read the Gita from cover to cover whenever he was feeling fragile. Now the brother had passed away, the copy of the book had been lost in the shuffle, and this gentleman from Texas was having a hard time himself and wanted his own copy of the Gita to read. Or there was the lady who had lived as a Hare Krishna in the very early days, but had gotten lost and disheartened in the ‘80s, and had walked away from Krishna consciousness. Now, with her first grandchild on the way, she was once again drawn to the big questions about life and God. On a whim, she had searched online for an old friend of hers from back when she was a devotee, and she somehow found Krishna.com. She peeked in the art gallery. She tentatively checked out the temple webcams. She listened to a lecture by Srila Prabhupada. And everything came flooding back to her. As if the spiritual journey of her youth had only temporarily been put on hold. 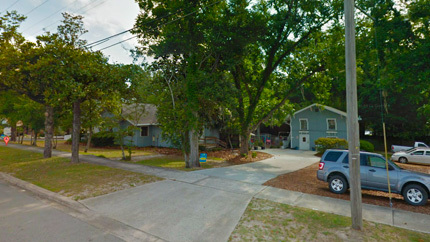 We’ve just purchased a new property in downtown Alachua that we hope will serve our expanding missionary needs. The property requires some modification and repairs before we can move in. 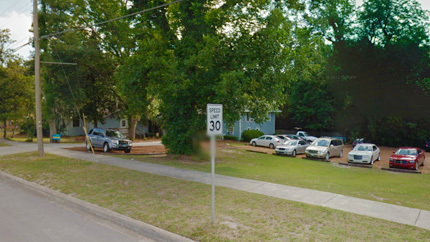 There are two historic buildings from 1915 that were remodeled in 1970. (Watch the video...) The location is great, the price was right, and we knew going into this deal that we needed to fix up the place, as donations come in. 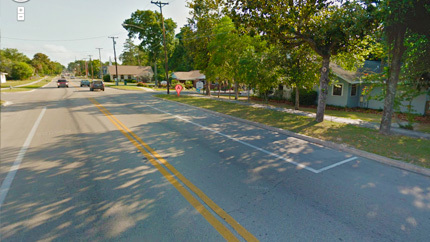 One of the buildings needs new siding; both need fresh paint on the walls, new floors, an upgrade to electrical wiring and plumbing, windows need to be replaced. Here's a graph that shows the various costs. Thankfully our parent company and well-wisher, the Bhaktivedanta Book Trust, invested in the building and purchased it for us with a generous contribution of $200,000. We only need to raise the remaining funds to move, to get the city permits, and to renovate the place. This is where we need your help. Please help us build a bigger “temple on the web” that will be able to serve millions more souls on their spiritual quest back to Krishna. Any and all donations help. A dollar, five dollars, whatever you would like to contribute. All donors will have their name displayed here on Krishna.com in gratitude for your gift. You can also choose to give anonymously (note that on your donation). Just let us know.